As Border Patrol uses violent measures to keep Central American people from coming into the United States, state-run insurance providers in Utah seek to maintain access to Mexican pharmaceuticals in order to save money. Utah’s Public Employee Health Plan is offering to cover the cost of travel and transportation to Tijuana so that patients can purchase certain high-priced drugs that are less expensive in Mexico than they are in the United States, The Salt Lake Tribune reports. 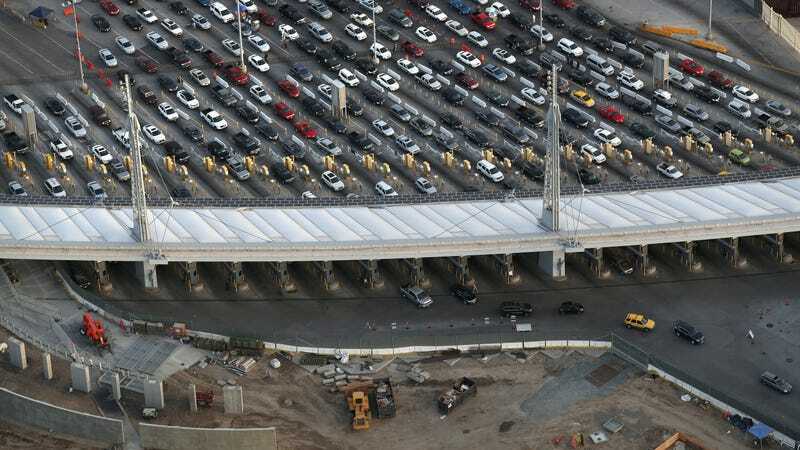 PEHP proposes to fly participating patients to San Diego, where they will be driven through a “priority lane” at a U.S.-Mexico border crossing and then to a “top-notch” Tijuana clinic to obtain the drugs. Patients who choose the “pharmacy tourism” option, as the Tribune calls it, will also receive a $500 cash payout. The benefits plan covers a handful of very expensive drugs like Avonex and Humira that treat conditions like multiple sclerosis, arthritis, Crohn’s disease, psoriasis, and various autoimmune disorders. A one-month supply of Avonex, the Tribune notes, costs approximately $6,700 in the U.S., while it only costs about a third of that ($2,200) in Mexico. “That money is pretty small in comparison to the difference between U.S. prices and Mexico prices,” PEHP clinical operations director Travis Tolley told the Tribune. At the risk of being reductive, it’s hard not to draw a parallel between news of a state-run insurance provider encouraging patients to travel to Tijuana as a money-saving measure and what happened at the San Ysidro border crossing on Sunday, where Border Patrol used tear gas and reportedly used other non-lethal weapons on migrants trying to come into the U.S. to seek asylum. It’s hard not to see how nakedly our government values resources over people.